New 1423cc GSX1100 Motor ready for delivery to a current Nostalgia Prostock Racer This weekend! We are proud to have been chosen as lead Engine Parts Supplier for Team Force Belgium Endurance team! Just delivered 3 Falicon Ultralite Supercranks to a leading European Endurance Team...very trick! 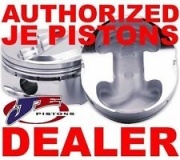 We are pleased to annouce that we will be offering the full range of JE Pistons and spares in 2019. road and off road, HD ,ATV . call! We offer Gearbox preparation for all makes, Drag Race and Road Race Undercutting.This is a GSX1100SZ Road race Box. Just back from another crackin Stafford Show in the Suzuki Village...Proud to be working with the Team Classic Suzuki Race Team ! We are Full speed ahead with several GSXR750 engine builds currently. call us for a quote for your winter engine preparation needs! Well done to our supported team! Rider Tom Weedon finished a stout 18th position on his diminutive GSXR750G from 56 starters.111mph laps! Congratulations Team! Hel coolers in stock...next day delivery! Just back from a great weekend at Dragstalgia,santa Pod. We ended up with 12 entries, great to see the variety, Kawasaki 750 triples,GS,Zeds etc.Our little GS1000 ran a best of 9.32 for the quarter! 12/06/2018Classic Kat Wins in Oschersleben ! Last weekend the Team Classic Suzuki,Vintage Parts Katana we provide parts and technolgy for won the Superbike class the german round of the endurance series! Well Done team! 07/06/2018Fast Fil gets Faster at Santa Pod! We had a fantastic result at the recent main Event International at Santa Pod raceway. the Gulf-puma Top Fuel Bike ran a best ever 5.78/236mph in Q2. and went on to win the event on Monday. Well done team! Back from a great weekend at this years classic Endurance race at Donington. Good to meet up with Old and new Customers! We have just created a new Sale section on the LH drop down on the home page for overstock/clearance offers! Check it out regularly!! The Gulf/Puma Top Fuel Bike Team welcolmed the new team owner, rider to Santa Pod at easter. Fillipos Papafilippou only managed a try out burnout due to the Weather. We are now pleased to be able to offer the excellent Magura range of Master cylinders and Throttles. Call for details! Magura are an excellent and economical replacement to OEM parts. Top quality at an affordable price! 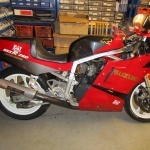 Just arrived, Rare GSXR750LTD for recommissioning. We just got this neat 1986 GSXR750 Ltd to recommission and register for the road. Chassis is completely original, fitted with a standard wet clutch type motor,which is more suitable for road use than the finnicky dry clutch model. 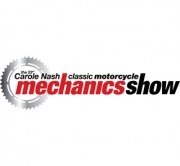 Dont forget to call and see us at our stand at next weeks London Motorcycle Show. Excel.Docklands. See you there! Show deals on all products! Just taken delivery of our new Street Twin! we will be adding a full range of performance parts for the Hinckley Twins on the site ......watch this space! We will be taking the bike to The Excel Show next month! 06/12/2017Christmas Promotion on Genuine Suzuki Parts! Through out december we are offering 10% discount on all new Genuine Suzuki Spare parts. Either call 07900 362809 to order, or if ordering online,we will refund 10% of the purchase price after checkout. Merry Christmas!! Just back from the excellent show put on by Suzuki GB in their Suzuki Village Marquee. Its great to part of such an excellent professional display of Suzuki Racing history! Its always good in this day and age to actually have chance to chat,face to face with our customers at events like this! Hope you all enjoyed it as much as we did! Our friend Kevin Feuz, from Switzerland has purchased the Kosman framed GS1150 PSB we built last year. Fitted with the latest 16v Billet 16v Monsterhead, developed by Mitch Brown and George Bryce, its sure to fly! Good luck to Tom Weedon this week racing Andy and heide's fabulous GSXR750H. We are proud to be chosen to supply performance parts to the Team! We now stock a full range of Uk Made Electrex Generators and regulator rectifier Units for Honda, Kawasaki, Suzuki, Yamaha, Ducati, Harley Davidson etc. See our listings for details or call 07900 362809 for pricing. Look for us in the Paddock this weekend at the 4 Hour Endurance race at Donington park! Just back from the Stafford Classic Bike Show, it is always good to get out there and meet up with new and old customers ,face to face! There certainly seems to be plenty of new exciting projects on the go out there! See you at the October one! 03/04/2017Valdosta GA Man Cup Drag Race. We are travelling to the 1st round of the Man Cup Drag Race Series ,held in Valdosta GA, USA this week, as part of Ian King's Puma Top Fuel Bike Team. We are running the full 5 round series in the USA this year, after winning a record breaking 10 UEM European Top Fuel Championships! Wish us Luck! If you are there , drop bye our Pit and say Hello! We are pleased to announce that we can now offer the Full Range of FMF Off Road Pipes and Silencers! 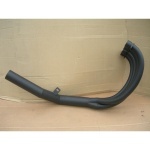 Fatty Front Exhaust Pipes, Powercore 2 and Turbinecore 2 Silencers are now in stock. These are a great product to use in conjunction with our Lectron MX and Off Road Carbs. Christmas is now out of the way, so its time to get weaving on that project rebuild in the garage! Call 07900 362809 for info and advice on any parts you need! Lets make 2017 a great year! Although we will be taking time off over the Christmas period, we will be despatching orders and answering Emails where possible in between Boxing Day and New year. 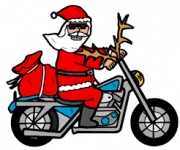 Wishing all our Customers a merry Christmas and a Happy, Prosperous,and Safe new Year! Nick and Sandra. It was great to see the build up of Suzuki Vintage Parts, Katana Endurance Racer at the recent NEC Live Show.The bike looked absolutely awesome, built by Nathan Columbi live on Suzuki GB\'s Stand. We are proud to be the Key Supplier to the project, of engine tuning components and the Keihin CR Special Carbs. Products supplied are our 1170cc Big Bore Kit, Web Camshafts, APE Valve Springs, APE Quick Access Clutch Cover, APE Manual Camchain tensioner, SPS Heavy duty cam chain , APE Adjustable Camshaft Sprockets , SPS Billet Sprocket Cover etc etc. We had an interesting trip last month to the huge Eicma motorcycle show in Cologne ,on the banks of the Rhine. The Show positively dwarfs the NEC show in Birmingham. Plenty of new stuff to see. you couldnt help but notice the huge street custom scene thriving out in Europe. Cafe racers in particular, not sure how it transfers over here in the UK, but is should...after all thats where the cafe race scene started...this is Mellow\'s take on a GS1000. What do you think?? Im thinking of building one this winter.......let me know! 04/11/2016Wossner MX and Off Road Pistons! New products, show deals ,info....call by! 06/10/2016Stafford Classic Show October 2016! 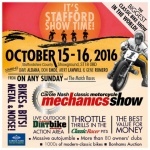 We will be at the Stafford show next weekend as usual! In the main Building where the auction used to be held...lots of new product to show you...come and have a chat! Congratulations to Andy onthe successfull debut of his immaculate GSXR750 Slabby at this summers manx classic. Ridden by daniel hegarty, it finished a fine 17th in the up to 1300cc open class against the mighty works supported XR69 bandit 1200 clones...well done Team! we are pleased to have been the primary engine parts supplier to the team this year and look forward to the new gsxr1100 based bike for next year to compete on the same level as this years winners! Just back from the European Finals, held at the UK's famed Santa Pod Raceway. The Gulf/Puma Top Fuel bike, ridden and owned by Ian King, clinched a nail biting, record breaking 10th (yes 10th!) European Top Fuel bike Championship. Im proud to have been a hands on part of Ian's team since he stepped up to Top Fuel in 2001. Well Done to all the team and sponsors who made this monumental acheivement possible! Its that time of year again when we travel over to the Hockenheim ring in germany for the annual Nitro Olympix Drag Races with the Puma-Gulf Top Fuel Bike ridden by Ian King. We had a great race last year, winning the event, we are all hoping for a similar result in 2016! This means we will be away until wednesday 24th august. I'll try and answer any e mails between rounds! We are now stocking Samco Silicone replacement Cooling hose Kits for all bikes.call 07900 362809 for info and pricing. We are working furiously to finish our new GS1150 Nostalgia Pro Stock Bike for the 2016 Santa Pod Dragstalgia event. The New bike features a Kosman Chassis, originally built by Star Racing in Georgia in the winter of 1989 for the UK's Wayne Saunders,who ran the bike at 2 NHRA meets ,early 1990, before bringing it back to the UK ,to dominate the class for the next 2 years. We have rescued the bike from a sad end,updated all the chassis parts and built a new Monster Billet head 1655cc motor , topped with VHR type GS1150 body from Beasley Composites in the USA. Paint by the great guys at Cross Customs, East Kirkby. Just back from another amazing weekend with the Gulf Top Fuel Bike at the renowned Goodwood Festival of Speed. Not at all in its natural element, doing burnouts up Lord March's Hillclimb course presents new challenges for the Puma-Gulf TFB ridden by Ian King, but a great time was had by all involved,and excellent coverage for our sport!! The new,long anticipated Jaygui 4-2-1 pipes for the gsxr1100 oil cooled GSXR's are almost ready...watch this space! Just arrived from Star Racing in Americus,Ga, the Monster Industry Billet 16v cylinder head for our new Nostalgia Pro Stock Bike. 36mm inlet valves, 31mm Exhaust valves give unmatched flow. Fitted with Victory Ti Valves and Web Camshafts, this will be installed on our 1655cc gsx1100 bottom and as soon as possible. We hope to run it for the first time at the popular Dragstalgia meet at santa Pod in July. Just an update to our successful lectron Carburettor sales program.....We are now stocking 36,38 and 40mm mx,enduro carbs ,with all the off road mods needed for a huge range of offroaders. KTM,Gas Gasm RM,YZ,CR,KX, Husky,Beta etc etc. call if your model is not listed. 07900 362809. Also check out the ginormous 50mm Pros Stock carbs we sell for big CC gsx1100 drag race motors with Vortex ,MTC,Ward or Monster 4v heads. We just received a new batch of these fantastic stainless race systems ....grab one while they last! 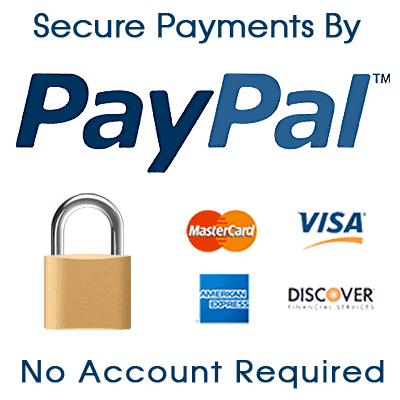 available for GS1000 , GSX1100, Z900 Z1000 GPZ1100\'s. 4-2-1 conical headers give amazing midrange and top end power. a must for any road race classic! these out perform all competitors on the dyno...harris...racefit etc. Just got the frame back from blasting and powdercoating. Great job by Tuff Coat , Kings Lynn, 01553 277654, ask for rachel or stew! Theframe is a Kosman Prostock chassis, from way back in 1990. Built in the USA by star racing for the UK's Wayne Saunders, who raced it at a couple of NHRA meets that year,before bringing it home to dominate the uk and european scene for the next 2 years. It was then campaigned by Dave Beck for several years and several ACU championships. We are building it with new running gear, fresh 1640cc 16v motor, more details as they happen! Call us for pricing and availability on the fantastic range of remus exhaust systems ! Austrian engineering at its most magnificent! BMW a speciality! We are proud to announce that we are now official dealers for the great range of yoshimura slip ons and full systems for all brands...road and off road. call for details! 07/12/2015Keihin Race Carbs and Spares! For 2016 we will be stocking many more varients of the keihin range of performance carbs! FCR's, CRS, etc. Amoungst the new additions to our range are the 35mm CR Specials for the 01 on Hinckly Bonneville range. call for details and info on complete carb kits and any spares needed. thanks!! More hot parts for your Kawasaki Z900/1000/1100! this is a wiseco 1075cc big bore kit. many sizes available. 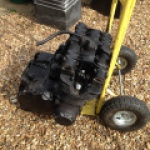 straight rebore in a 1015cc block. Feeling the need for some more umph from our venerable 1979 GS1000 drag bike, we have shoehorned some half inch lift cams in that we had hanging around the workshop! much grinding or the head was needed to get them turning freely, all shimmed now, ready to bolt the head back on! 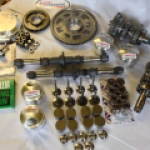 We just supplied this top end package for a customer\'s tuned 1978 F2 750 sohc. it will be mated to a wiseco 836cc big bore kit we supplied. More and more people are rebuilding these old Hondas with upgraded engine internals,rather than using the standard Honda replacement parts,and thus enjoying a much livelier improved performance. 14/09/2015Drag Race parts Clear out! 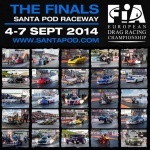 03/09/2015Santa Pod Euro Finals ! It's that time of year again. The culmination of a years racing across europe. We find ourselves in second place going into the final round of the championship behind Sweden's rikard Gustafferson. The Gulf back top fuel bike team , headed by rider ian king need to win one more round than the championship leader to annexe a record breaking 9th euro title! Try us for all MPS racing products! Nitrous kits, sportbike air shifters, Switches and other drag race electronic parts! Just back from a very very hot Nitro Olympix, where we won the Top Fuel bike eliminator for the second year in a row! 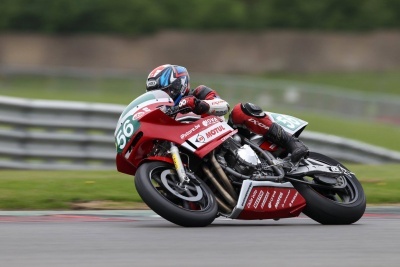 Ian rode the Gulf sponsored Puma powered bike to consistant 6.30's at200 mph plus on Sunday to grab maximum points in the european championship chase! We are about to leave for the annual pilgrimage to the Hockenheim ring in germany for the Big drag race held there each august. We are crewing as usual for the Gulf top fuelbike team of the UK's Ian King, We are hoping for a good track to carry on with our recentl series of 5.8 second 1/4 mile passes! we have recently expanding the rangs of cometic base gaskets and base spacers,considerably, call us with your needs! We had a great weekend at santa Pod Raceway, for the annual Dragstalgia event. saw a lot of old faces, and a few new ones! The old faithfull gs1000 even made a few 1/4 mile passes, we eventually got the clutch to play ball and ran a string of 10.20's which considering the state of tune, is about on the money. New cams will step it up considerably for the next meeting. If you like classic aircooled dragbikes, santa Pod's dragstalgia event this coming weekend is the place to be! 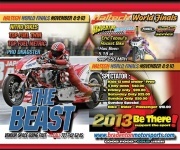 we will be there with our GS1000 prostocker running in the NSA bike shootout on saturday and sunday! Sorry, but we are closed Monday 15th june until the following Monday 22nd june. Summer Hols!! 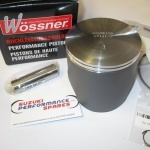 Just got a batch of Wiseco 836cc piston kits in stock, we now carry most tuning parts needed for the old war horse Honda CB750's......engine parts and dynatek ignitions! We are proud announce our recent appointment as a key distributor for all Goodridge fluid transfer products. Brake line kits, oil cooler kits, Oil and fuel fittings and hoses, plus many ancilliary products. Call our sales office on 07900 362809 for details. 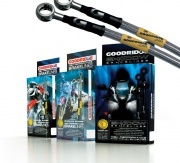 We will be rolling out many new exciting goodridge products onto our Web site and Ebay shop over the coming weeks! Sorry but we are away for a break from friday May1st till friday may 8th...all orders will be processed as soon as we return! Thanks for your business!! We will be attending the 35th International Classic Motorcycle Show at Stafford Showground on the 25th and 26th of April. We are in the main hall. Come along and find us for a chat and to see close up some New products and grab a tasty show deal ! We are pleased to continue our expansion of NOS and Nitrous Express products we can offer for sale. Just got these NOS progressive nitrous controllers in. very small items, easy to use and install, reasonably priced! 07900 362809 or buy online! 27/03/2015GS1000 GSX1100 530 conversion kit. We now stock Regina chain and sprocket kits to enable you to convert your gs1000/750 and gsx1100/750 from the old heavy 630 size to the more modern 530 size and X ring technology. 03/03/2015GS1000 - GSX1100 Clutch Conversion. For years many racers have used the better gsx1100 clutch basket in the chain drive gs1000. the primary gear is the same, you just need to shorten the basket and inner hub height. Doing this also reduces the plate amount to the same as a gs1000, 8 of each instead of the gsx1100's 9 count. To enable you to drop a gsx1100 clutch basket into the gs1000 cases, without maching the basket and hub, we have produced a billet spacer to move the cover out just enoughto allow this. £110 plus vat. 01/02/2015GSX1100 X 2 for Breaking! Just got some more GSX1100's in for spares...all parts available..call me up on 07900 362809 or send enquiry in....ESD and EFE models,. 19/01/2015Lectron MX Enduro Carbs ! We can now supply from stock 2 stoke Lectrons, 36 , 38 and 40mm from stock, custom assembled for your MX enduro or trail bike. Models covered include Husqvarna, KTM, YZ, CR, KX, RM , Beta , a nd Husaberg models. call 07900 362809 for info,. We are also stock rebuild kits for all Lectrons, 2 and 4 stroke. We are currently putting together a 80mm 1325 GS1000 2v. Unlike many larger 2v motors, this is built using a gs1000 crankcase, not a 16v set. we will be using it in a new classic prostock gs1000 dragbike we are building. It will feature a 66mm crankshaft, 1/2/3 auto 5 speed gear box, MTC multistage lock up clutch system, CP Custom Pistons, APE cylinder studs,nuts,case studs,valve springs, Trac king clutch, Web Camshafts, Kibblewhite shim under buckets, Lectron 40mm powerjet carbs. etc. To keep us busy this winter, w will be rebuilding this tired but original GS1000S. It will feature many of the parts and services we offer, and will be seen thru the coming year at various shows and race meets we will be attending. I will try and keep regular updates and pics of the project's progress. We can now supply the vast range of USA made,Vortex rear sprockets for most sports bikes. If you bike is not listed please call for availability on 07900 362809. We are stocking more of the excellent MTC forged piston kits. new additions this week are an 1170cc kit for the Kawasaki z1000J, GPZ1100 B1, nominally 12:1 cr ,so they are ideal for a road race type engine where you are looking for around 11:1 cr. 17mm pin size (18mm available) these bore straight in the gpz1100 cylinder. 19/09/2014New Range of hand bend Race pipes! Just back from the Euro Finals at Santa Pod.The Gulf King Racing Top Fuel team clinched another European Championship at the meeting. it was however at the expense of their usually super reliable Puma Nitro Engine....... Oil pump issues during the run caused a catastrophic engine failure and subsequent fire! Well Done team!! 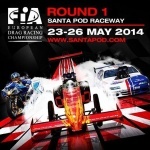 03/09/2014Santa Pod Euro Finals ! We are off to Santa Pod this weekend as part of the championship leading Gulf/Puma Top Fuel team, ridden by Ian King, we are hoping to clinch the championship during the uk's biggest drag race! Another set of 50mm Pro injectrons going to a new 2 valve pro mods bike in the usa. First in the 3's?? Just released...Dyna performance DCOP coils for hayabusa/ZX14/ZZR1400/R1/ZX10R.....ideal for high performance turbo and nitrous applications. we have reduced the price of the Gazi Hyper X shocks for the gsx1100's significantly! grab em while you can! My own GSX1100 e for sale. runs great, standard carbs/airbox, harris pipe , needs a final drive seal. rear shock bit short of damping . £1850. 05/08/2014Regina Chain & Sprockets Kits. We have managed to negotiate a better deal on web cams which we are pleased to be able to pass directly to you our customer! contact 07900 362809 for details. 22/07/2014Dutch Classic Racer uses our sprocket cover! Chris van der Weide\'s cool GS1000 racer with one of our XR69 type sprocket covers! lookin good chris! 14/07/2014Our GS1000 Nostalgia ProStocker Runs! Just got a 1276 cc 12: 1 kit back from MTC, bored,relinered ready to rock in the customers bandit 1200 std block. Off to santa Pod for the first round of the european dragbike championship,to defend the gulf top fuel bike's european championship....should be fun if the rain holds off! well done to Suzuki Performance Spares customer Paul Arroyo in Spain who acheived a great 3rd place in the competitive post clasic series race in Valencia last week...well done Paul! his GSX1100 uses our Trac King clutches and Race Prepped undercut gearbox assembly. Bit of a coals to newcastle event.....we have just supplied a doner engine to non other than Fujio Yoshimura, who wants his illustrious tuning company to recreate a race GS1000 engine. Looks like they know a top GS1000 supplier when they see one! 18/04/2014MTC 5 Second Club, King Gets His Place! We are just back from the man cup race in valdosta Georgia, where we grabbed the last remaing spot in the MTC 5 second club,for the first 8 top fuel bikes to run 5 seconds in the quarter on a US track.The Gulf top fuel Puma ,ridden by Ian King ,ran 5.87 @ 225 to defeat Chris Hand in the final.Suzuki Performance is proud to be a part of the all conquering Gulf team! We are travelling to the USA this week as part of the crew for the King racing Top Fuel Drag Bike. The Gulf Racing supported Puma top fuel bike is gunning for the coveted last spot in the MTC 5 second club.Suzuki performance have been working closley with the King team since 2001, and see it as essential to keep at the leading edge of quartermile technology. Dont forget to check us out for the excellent range of Falicon crankshaft, clutch and associated performance products,made in Florida USA.Any parts not in stock can be rapidly obtained ,and added to our weekly shipments. call 07900 362809 for details and information. In stock, ready to ship! Lightweight Stainless full race system. fits all years of gsxr1300 hayabusa. GS1000 GSX1100 owners! cure that annoying and ultimately destructive clutch rattle with our conversions to your own basket. we replace the shock absorber springs with usa made heavy duty items, new stainless rivets and then TIG weld the assembly on a jig fo accuracy and long life. call me on 07900 362809 fast turnaround!! Just got an original low milage GSX750 Ex in to rebuild for customer.Although often overlooked the smaller GSX can make for a nice sporty 750, when freshened up. This motor will be cosmetically revamped, fitted with a wiseco 816cc piston kit and road and track cams. we will post progress reports over the next few weeks. We can offer a full range of engine rebuild services to all suzuki models, from gs750\'s to Hayabusa\'s! 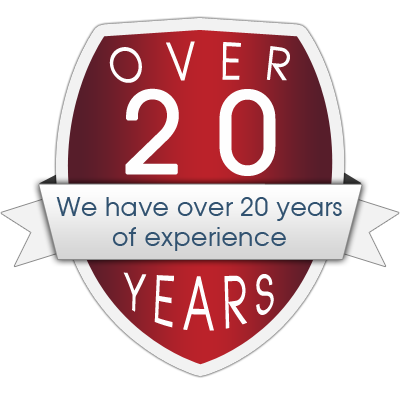 All work carried out to exacting standards in a timely and cost effective manner. call for details on 07900 362809.We can rebuild to standard specifications , fast road ,road race spec or drag race spec.Results are our aim! These are a few of the engine tuning parts we supply to the uk's leading bike builders for their XR69 replica's and classic race teams. call for details! 16/02/2014Twin Shock XR69 NZ bound. Good Luck To Roger Winfields team over at the Phillip Island Classic road race meeting in Australia this weekend. We are pleased to be a key supplier of suzuki GSX1100 performance engine components to the team who are equipped with harris framed F1 machines. 22/01/2014Kerker Eddy Lawson Rep Exhausts! This is a FANTASTIC XR69 GS1000 just finished by Nigel Everett bound for New Zealand. originally commissioned by Graeme Crosby himself, it was diverted to a ultra keen customer in Auckland. Croz will have to wait a few months! We are proud to supply Nigel with Performance engine components for his XR69 projects. 05/01/2014MTC Heavy Duty Clutch Baskets available! MTC heavy duty clutch baskets are forged aluminium assemblies designed for the most demanding applications! All MTC clutch baskets use hardened steel backing plates and rivets.They are assembled in house at MTC, all rivets are pressed[same as oem] using hardened tooling and a 50 ton press. The ultimate basket assembly! 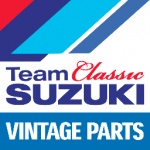 For all you facebookers out there we invite you to find our page..'suzuki spares' We are always posting new and interesting snippets and photos of new goodies on there! look forward to seeing you! We can now supply APE tool steel wrist pins for most popular applications. Wiseco/JE/Wossner etc. The APE gudgeon pins are machined from tool steel bar stock, then heat treated fror maximum strength. We have just finished a batch of gsx1100 top end oiling kits. billet adaptor plate which can use the oem pressure switch unlike most other kits around.they come complete with earls anodised fittings and stainless autoflex hoses. final assembly and cutting of the hoses is left to the end user due to differing routing requirements. Dont forget we can offer a full range of crank preparation for all road and race applications. welding,new rods,bearings,straightcut primary gears etc. over 30 years of experience in these roller cranks! this is a batch of early gsx1100 cranks just prepped for road race action, complete with straight cut primaries,new Katana 493 con rods, new big ends,welded and indexed, ready to race! Off to the bradenton Florida dragraces tomorrow to catch up with suppliers and friends, and source more up to date goodies to supply our customers need for SPEED!! 05/11/2013Suzuki XR69 Replica Frame just arrived! Getting along nicely now, the 1176cc GS1000 motor is finished and buttoned up ready to run. just wiring and the plumbing to complete now.We should get out early in 2014 to iron out any bugs, then run at any nostalgia/classic dragrace events we can find. 23/10/2013Web Camshafts. Increased Range this Winter! 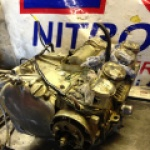 We are currently busy preparing engine parts for a new well funded Suzuki Classic endurance team! heres a few billet falicon clutch baskets with straight cut primary gears destined for the new engines. Just back from dropping some more tuning goodies off at trident, and snapped their gorgeous xr69, freshly back from the manx classic, where it was racing with a gsxr1100 oil cooled motor,instead of the usual gs1000 air cooled motor,to take advantage of the current rules. Built by the same customer..this is his road going katana.....how trick is this! great stuff! One of our French customers gs1000 race bike, running our Dyna 2000 ignitions.....looking good!! we have just obtained some excellent low milage gs1100g cranks, which can be used as the basis of a 66mm crank conversion for the chain drive gs1000. the extra stroke matches the gsx1100's and the rods are much stronger than the oem gs1000 items. 23/09/2013GSX1100 EZ just in for spares! 19/09/2013King of Europe the Seventh!! Congratulations to Ian King and Team for a fantastic 7th european top fuel title on the GPO/GULF/PUMA top fuel drag bike! 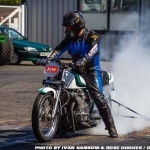 Ian clinched the title at the recent euro final meet at Santa Pod raceway, along with becoming the first uk rider to make a 5 second pass on home soil. We can now supply from stock Falicon Billet aluminium clutch baskets, factory assembled by falicon with MTC straight cut primary gear and chr mo billet back plate and heavy duty springs.we can supply gs750 ration gears to order. 07900 362809. we can also supply the matching crank gear,also this basket can be used in the gs1000 engine. We are off to Santa Pod Raceway this weekend,working on the Gulf Oil/Grand Prix Originals Puma Top Fuel bike,ridden by Ian King. Ian goes to the final event of the year leading the UEM top fuel bike championship .Fingers crossed for a dry weekend and a good performance from the team to secure our 7th european championship! 30/08/2013Push Pull Throttle assemblies for smoothbore carbs. We now stock Motion pro Push pull throttle assemblies for use with mikuni and keihin smoothbore carbs which need a push and pull throttle cable. the kit is complete with both cables and the twistgrip housing assembly itself. Now stocking tensioners for cbr1000rr and cbr600rr models. 27/08/2013SV650 V twin tuning parts in stock! we now stock APE heavy Duty cylinder studs and nuts for the sv650 model. ideal for modded bikes with big bore kits or more compression. We now stock the excellent Dyna Mini Coils for applications where space is really tight! see listings or call 07900 362809 to order! 25/07/2013Busa gsxr1300 big stud head gaskets in stock. we are pleased to be able to announce we have considerably increased the range of APE parts we hold. we can now cover most modern sports bikes as well as the older post classic inline fours. pls call 07900 362809 for information. trade enquiries welcome. We had a great time at goodwood festival of speed recently,crewing on the awesome Ian King/Gulf Racing Puma top fuel bike! Amongst the many top names showing great interest in the King of the dragsters was none other than King Kenny Roberts! Steve Watson has nearly completed the rebuild of the ground breaking 960cc kawa turbo bike of the late Steve Tong. Steve Watson rode the bike for ST back in the mid 80's, and is looking forward to getting astride the beautifully restored kosman framed comp bike again. In its day its low 8 second times were ahead of the pack for a gas burning bike in europe.It will be great to run our restored GS1000 along side it soon! 19/07/2013Complete Gasket Sets For all Bikes! we now stock the excellent APE Super Pro Air Filter sets,in 50mm and 42mm. the smaller size suits older slide carbs as found on gs1000/750 and early z900/1000 /650's, the 50mm onese suit cv carbs gsx1100/z1000j etc and mikuni rs flatslides. £59 99 a set of 4! BARGAIN! 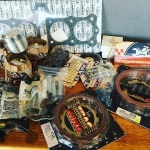 we can supply a wide selection of goodies for anyone racing and tuning one of the older cb750 sohc engines. Camshafts,piston kits,gaskets,heavy duty valve springs, slotted cam sprockets,heavy duty camchains and clutch kits...try us! We stock a range of UK made,top quality GRP replacement front guards in gloss black gel coat finish. GSXR1000/750/600 all years, gsxr1100/750 slingshot, sv650/1000, bandit 600/1200, gsxr600/750 srad. We can supply Stainless one Piece valves for most motorcycle applications,in standard or oversizes. Many of our valves,including the pictured GS1000 valves are plasma coated for a harder wearing ,low friction surface finish. call or e mail for details. 09/07/2013King Racing/Gulf Oil Dragracing Wins in Finland! 6 time European Top Fuel Champ,Ian King wins the 2nd round of the 2013 championship in Alastaro Finland! Top Job Team! We have added a range of replacement screens for rickman fairings to our range. see our listings or call 07900 362809 for more info. Progress has been a little slow recently due to how busy we have been recently! thanks to you for all the orders! Any way,just got the paint work back from Paint Work Express in Wisbech..Great finish thanks Geoff! I decided to keep to the original Steve Tong Racing colours and design..very retro! This hopefully will inspire me to get on and finish the bike soon! At the 2nd round of the uem top fuel bike championship in Alastaro,Finland ,the Puma Yamaha ridden by ian King is in the No. 1 qualifying spot after day 1. with a 6.24 secs @ 365kph on the sometimes tricky finnish track....good luck for today team! We can supply a wide range of reprofiled gsxr1100/750 and bandit 1200 camshafts.suitable for road and race,we have around 8 different profiles available. priced @ £245 pair. for the older 85 to 91 gsxr1100/750's and the badit 1200/600 we now stock the ape alternator blanking plates. 07900 362809 or online. Full range of ek drag race chain now available from stock. EK630ms,EK630shb and the popular EK530drz2,all in stock plus spares links etc. 07900 362809 or see listings. 17/06/2013King Racing/Gulf Oil Dragracing into the Fives! Congratulations to Ian King owner and rider of the Gulf Oil sponsored Puma Top Fuel dragbike on breaking in to the 5 second zone on a first round win in Tierp Sweden yesterday.,with a run of 5.98 seconds @ 220 mph! 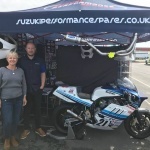 Suzuki Performance are proud to be on the team! Kenneth Vik commences his 2013 fim pro stock title challenge this weekend at the tierp arena in Sweden aboard his Suzuki Prostocker. 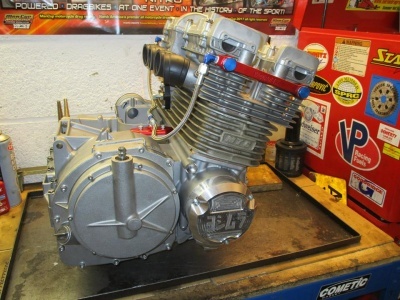 New for this year is the Star Racing built 1720 cc GSX1100 motor,featuring Star's new billet MonStar cylinder head. 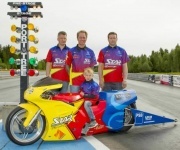 Great to see Star Racing from Georgia USA involved with a Suzuki Project in Europe again. We raced prostock bikes with Star motors in the 90's and early 2000's with Star power with great success.Star are our No. 1 supplier of quality USA made performance products to this day! 12/06/2013Pingel Hi flow performance Fuel taps. Full Range of pingel taps and adaptors are available from stock,for road and race applications. 07900 362809 or buy online. We stock a range of air shifter kits for drag racing and spares. air over air and air over electric types. pingel and mre. We can supply Race prepared gearbox's for the gs1000 and gsx1100. heat treated and magnafluxed,with the engagement dogs undercut for up and down shifts,for road racing. 05/06/2013GS1000S + Dyna S = smoother running! We have just finished a batch of trick looking heavy duty ignition covers for the gs1000/750. the finishing touch for your race rep?? We stock the full range of APE manual camchain tensioners , they are a must on any hard ridden sytandard or modified bike. APE are the original manufacturers of the manual tensioner...insist on the best for your bike! Just got these in for a customer,on their way to New Zealand in fresh 1230 motor. 20mm pin falicon oval section heavy duty con rods.....nice!! 03/06/2013Taylor 8mm spiro pro Ignition Wires. made in the usa! Full range of taylor top quality plug wires and caps in stock. we carry 2 styles,the '180' for air cooled motors such as the gs1000 gsx1100,z900/1000 and the 'R' style with a deeper plug boot for gsxr oil cooled engines and watercooled motors. full range of colours,red,blue,black,yellow,lime green,hot orange! we stock the GS1000 S nose fairing and matching screens in clear/tint to help you create that wes cooley superbike look for you gs1000 project. uk made in fibreglass,gloss white gel coat finish. Full range of wiseco kits available. gs1000 73mm kits in stock. 01/06/2013Dyna Coils in stock for all applications! 01/06/2013Steve Tong Pro Stock Bike restoration. We are currently rebuilding the ex Steve Tong gs1000 suzuki prostock bike. Steve sadly died last year and we purchased well known bike from his estate in order to restore it to its former glory and race it at classic drag race meetings in the uk and europe. The bike is unique in that Steve garaged it after a race in 1984 and it was not touched till we stripped it for restoration. Most if not all bikes from that era were modified and changed beyond recognition in the quest for fast and quicker! The bike also has some interesting history,in that it was non other than Pip Higham's original Gs1000 street bike. we will keep updating with pics of the rebuild as we progress. 01/06/2013VANCE & HINES Exhaust Systems. We stock VHR pipes for your classic 4 cylinder bike! Z900/1000/1100, GS1000 GSX1100 Street chrome systems and the drag race only Pro Pipes for the GSXR1100,GS1000,GSX1100,Z900,Z1000. call for availability! 01/06/2013Upgrade you Ignition for less than you think!! Dyna S ignition systems for classic 4 cylinder bikes are the simple fix for your ignition issues! Simple to fit.3 wires only,no separate black box,replaces points or older cdi systems. from £125. Z400/500/550/650/750/900/1000/1100 ,gs550/650/750/1000/1100 ,gsx750/1100,katana,cb400/500/550/750 sohc models. see listings. We now stock a range of custom assembled oil cooler kits for the suzuki gs1000 . a must for tuned road or race machines. available with various spec fittings,brackets and hoses. 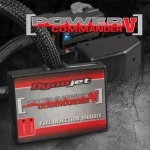 07/05/2013Dyna 2000 Digital Ignition Systems now in stock!